The town of Norway encompasses an area made up of several tracts of land granted by the Commonwealth of Massachusetts (Maine did not become a separate state until 1820). One of these tracts was purchased by Captain Henry Rust of Salem, Massachusetts and became known as Rust’s Plantation or Rustfield. In 1786 five men from Gray began clearing land in the wilderness and were the first settlers of Rustfield. Joseph and Jonas Stevens, Amos and Jeremiah Hobbs and George Lessley made preparations to settle on land purchased from Captain Rust. In 1787, the men returned with their families to become the first permanent residents. Their farms were located in the area of the western shore of Lake Pennessewassee, along what is now the Waterford Road, along the Greenwood Road and at Norway Center. In 1789, Captain Rust built a saw mill and a grist mill at the outlet to the lake near the upper end of the current Norway village, and his nephew operated a blacksmith shop. These were important steps toward the future growth of the town. Between 1787 and 1790, more families settled in the area, with the 1790 census listing a population of 448. By 1797, the population of Rustfield and neighboring tracts increased enough to form a town, resulting in the incorporation of the Town of Norway on March 9, 1797. The reason the town was named Norway is not documented, but it is known there were no Norwegian settlers. The name for the new town was going to be “Norage,” an Indian word for falls, referring to the Steep Falls section of the town; however, the word may have been misspelled as “Norway” in the petition for incorporation or other government documents, so Norway it has remained. The first factories in Norway were Captain Rust’s saw mill grist mill built in 1789 on the outlet stream of Lake Pennesseewassee. Bailey Bodwell, who settled in Norway in 1799, built a carding mill in the same area; however the power afforded by the stream was not adequate. 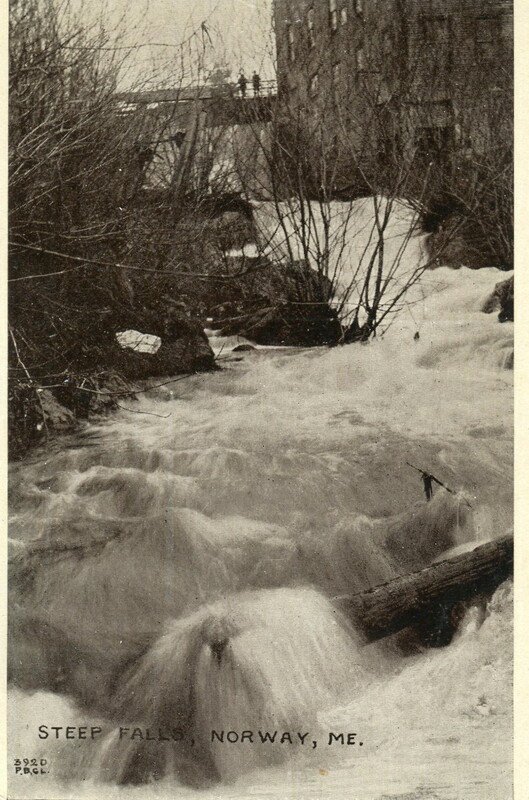 In 1804, Bodwell built another carding mill at the Steep Falls section of Norway (the falls are across the street from Aubuchon Hardware on Lower Main Street), where the water power was much stronger. This began a series of industries locating at Steep Falls until the last business closed in 1923. These mills included a tannery, a foundry, a soap factory, a pulp and paper mill and a grist mill, among many others, plus an electric generating station to produce power for street lights beginning in 1888. 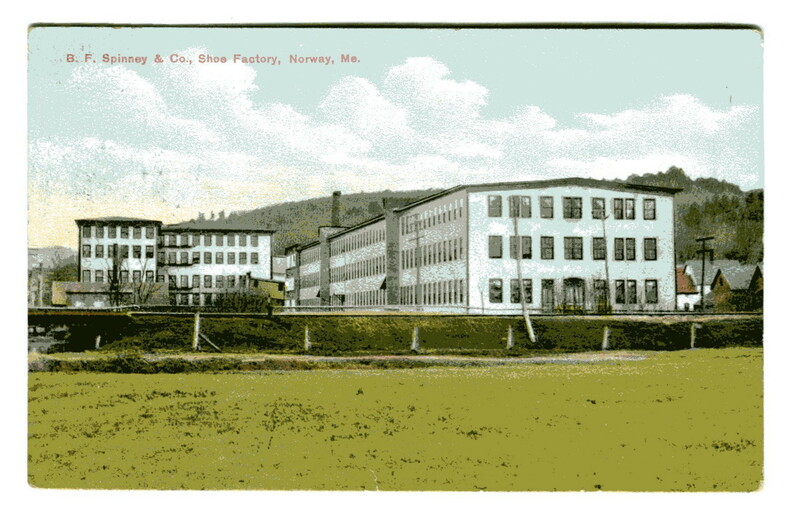 The last factory located at Steep Falls burned in 1923 and was rebuilt elsewhere in town. Shoe shop located between Lynn and Danforth Streets. One of the most important industries in Norway’s history is the manufacture of shoes. A shoe factory was built in 1872 along Lynn Street and remained in business under a variety of owners for about 100 years. Norw ay was well known for snowshoe manufacturing and Norway-made snowshoes were used by Arctic explorers Robert Peary and Donald MacMillan. 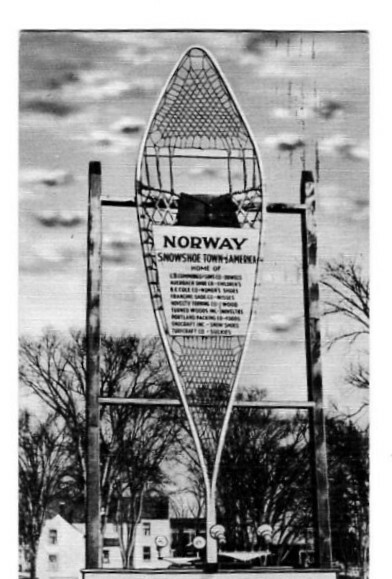 This giant snowshoe greeted visitors as they came into town, describing Norway as Snowshoe Town America.